Alex and Tateyana both have a deep passion for food and wine. The roots of Tateyana’s incredible cuisine can be traced back to her grandfather who taught her most of what she knows. Like Tateyana, Alex also learned to cook from his grandparents, and also comes from a family with culinary history. His great-grandfather ran a pastry house in south Russia. Alex and Tateyana live in a studio apartment decorated with Tateyana’s beautiful paintings. 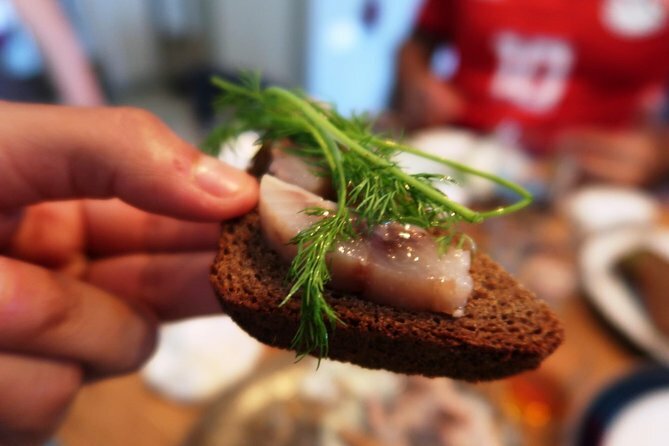 You will be welcomed with starters - rye bread with a sweet and savory dip of fish paste mixed with apples, after which you will join them in the kitchen for a hands-on cooking class, followed by a meal. - Notes: Alex and Tateyana can cook vegetarian meals on request. Join Alex and Tateyana in their home kitchen to learn to make three traditional Russian dishes from scratch, in your 2 hour cooking class. Begin with chopping ingredients for the quail stuffing and wrap the quail with some beautiful bacon before putting it in the oven. While the quail bakes, you will start to chop up vegetables and ham for the okroshka soup and then knead dough to prepare pryaniki (Russian ginger bread cookies). At the end of the cooking class you will learn a lot about Russian culture and cuisine and even what the great Russian writers Pushkin and Dostoevsky preferred to eat! After your cooking class a few dishes that you might try at the dinning table are salo (lard), okroshka or borscht (soup) and bacon wrapped roasted quail served with salad. Your meal will end with a sweet dessert, such as homemade baked cake with homemade jams or pryaniki (Russian ginger bread cookies), served with kvass (beverage commonly made from rye bread) or Russian tea. Please meet your hosts Alex and Tateyana at their home in Nosovikhinskoye Shosse.